Tri-state residents on Monday fought unplowed streets and massive snow mounds along with mass-transit delays left in the wake of the historic blizzard that dumped nearly 3 feet of powder on parts of the region and left at least 17 people dead. Snow cleanup continues to mixedreviewsacross the tri-state, and officials are cautioning drivers to watch out for black ice as temperatures through the week are expected to melt the snow during the day, then drop at night to re-freeze it. A black ice advisory has been issued in New York City through Friday night. Transit issues persisted into the evening rush Monday, with several LIRR lines still offline after most rail and subway service were suspended over the weekend. The MTA says the rail should be fully restored systemwide for the Tuesday morning rush. The region's three airports were open, but travelers still had to fight with delays and cancellations as airlines were continuing to clear a backlog of more than 12,000 flights that had been canceled nationwide over the weekend. It created an especially severe backup at LaGuardia Airport, where road traffic was gridlocked into the night, with people waiting up to two hours to get into or out of the airport. 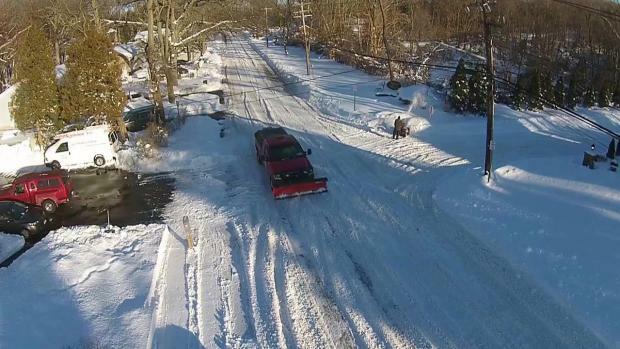 Drone footage of this year's blizzard on Long Island. The death toll from the blizzard, meanwhile, inched up in the tri-state Monday for a total of at least 17 so far. One death in Brooklyn was suspected to be related to carbon monoxide poisoning from a warming car. The victim, 44-year-old Angel Ginel of Brooklyn, was found in his car after his wife called 911 when he didn't return home from shoveling. His death may be similar in nature to those of a New Jersey mother and child who died over the weekend from carbon monoxide poisoning as they sat in a car the child's father was digging out, authorities said. And in Mahwah, New Jersey, police were also investigating the death of a 64-year-old woman found partially covered in about a foot and a half of snow, shovel in hand, outside her home on Sunnyside Road Monday afternoon. Authorities said the body of the woman, identified as Mary Wall, was discovered by a group of middle-aged school children when they saw a coat sticking out from the snow. Police believe Wall had a medical emergency while shoveling out her car. The storm dropped a jaw-dropping 26.8 inches of snow on Central Park -- just one-tenth of an inch away from the all-time highest snowfall -- and the 26.6 that fell Saturday was enough to mark the heaviest single day of snowfall since recordkeeping began in 1869. Other areas of the city saw even more; Jackson Heights, Queens, saw the region's highest snowfall total with a whopping 34 inches while large swaths of New Jersey and Long Island saw totals approaching the 30-inch mark. But conditions are continuing to improve. Plows have been seen through most of the region clearing of streets slowly but surely, and just one New York City teacher called out Monday morning. Many residents in large swaths of Queens, however, woke up to streets that had been untouched by the city's fleet of plows. Mayor de Blasio said Sunday in an exclusive interview with NBC 4 New York that it amounted to "two realities" for the borough as he vowed to have the city work harder on clearing out the streets in the city's most diverse borough. Monday morning, residents were still fuming over unplowed streets that were so hard to navigate even plows got stuck. “They should have made a couple of passes and it would have never got to this point,” one Corona man said. Some residents in Newark say they're frustrated over unplowed streets. Others have decided to take on the task themselves. Jen Maxfield reports. Mayor de Blasio acknowledged Monday that there hasn't been enough progress with plowing strets: "I want more." When pointed out that one street in Elmhurst was untouched since the snow stopped, de Blasio said, "That's not acceptable to me. During the storm is one thing. The day after, every street should have been touched." As plow work continued, de Blasio reminded drivers in the city that they didn't have to move their cars until Feb. 1 and pleaded that if they had to drive, not to put snow that had piled up around their vehicles back into the streets. Black ice and snowy choke points remained a threat to drivers Monday, and officials have warned residents to refrain from any unnecessary driving. Numerous roads remained impassable, from the city to surrounding suburbs, and commuter trains will be delayed or canceled for many despite crews working around the clock to clear tracks and roads. Long Island Rail Road service was expected to be fully restored by Tuesday morning. See the latest LIRR alerts here. Metro-North trains are running. See the latest Metro-North advisories here. NJ Transit rail, light rail and bus are all running. Some trains and buses are running with delays due to the weather and road conditions. See the latest NJ Transit alerts here. Most PATH trains are running on normal schedules, but no trains will run between Newark and Journal Square. No service is expected between the stations until after the morning rush Tuesday. NJ Transit is cross-honoring PATH tickets See the latest PATH advisories here. NY Waterway ferries are running on or close to schedule. See the latest NY Waterway advisories here. The Staten Island Ferry is running normally. The Seastreak Ferry is running from all locations. See the latest Seastreak Ferry advisories here. Amtrak trains are running on a modified schedule along the northeast corridor. See the latest Amtrak alerts here. Westchester's Bee-Line Bus System was running with 30 minute delays Monday. See the latest Bee-Line advisories here. Mayor de Blasio gave himself fairly high marks Monday but many city residents say their streets are still unplowed. Melissa Russo reports. New York City Schools were open on Monday. Newark public schools will be closed on Tuesday. Hundreds of other school districts announced delays and cancellations. Some roads remain treacherous. Motorists are advised to use caution when traversing the region. Alternate side parking in New York City is suspended through Feb. 1. The city is also allowing cars currently parked next to schools in "No Standing - School Hours" zones to stay parked until Feb 1.